Using SEO Manager, you are able to control your local business structured data. This is beneficial for businesses that have a brick and mortar location, and is a fantastic way to continue giving your customers easy-to-access information about your business. 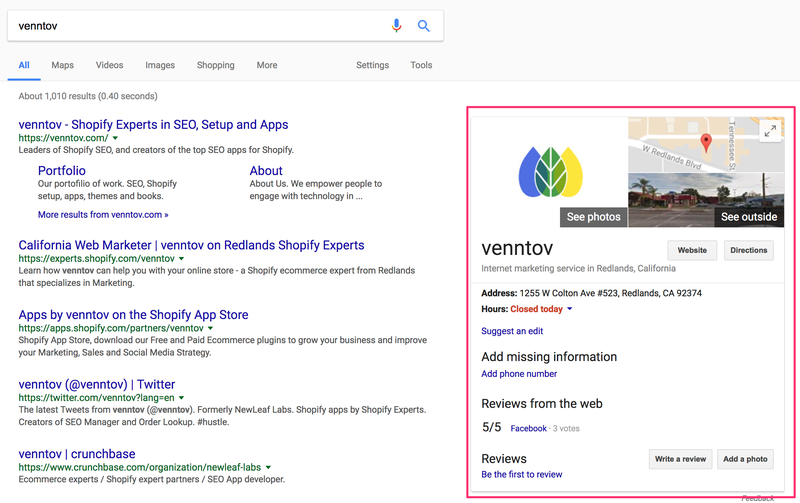 When people search for businesses on Google Search or Go Maps, the search results may display a prominent Knowledge Graph card ( box of information) with details about a business that matched the search query. This data can be provided to Google though on-page structured data. SEO Manager for Shopify uses Google's preferred structured data format, JSON-LD, to deliver information about your store to Google. If you have a physical location we suggest that you enable this feature This information is not required, but it can be used as another ranking factor in Google. From here you are able to enter in your location, hours, and contact information. This all helps your business get found on Google, and can help you get more foot traffic into your store.